I liked the fact that it is a university that you can study college courses at and, because it is a university, they treat you more like an adult. I chose this course because it was more practical-based and there are animals on campus that you work alongside daily. As part of the 1-year course, we study animal health and welfare, feeding and accommodation and three additional modules, which include farming, British wildlife and rehabilitation and animal biology. I would recommend this course to another student because it is very interesting and if you want to progress but you can’t because of your GCSE results, then you can retake them alongside the course. I did a placement at Stonebridge City Farm. I really enjoyed it because you have lots and lots of hands-on experience and every day is different. 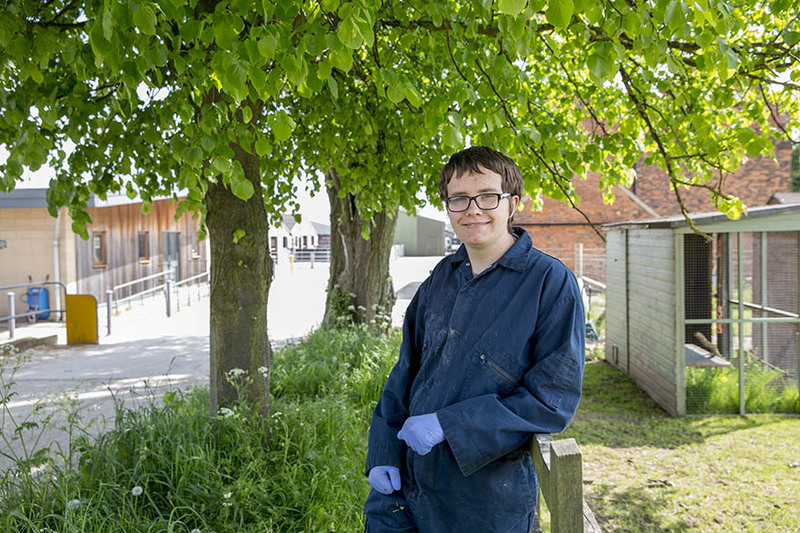 As part of our duties at Brackenhurst at the animal unit, I have learned how to work in a team to do jobs correctly such as sweeping and mopping which I would need to do in the future. I found the course tutors very nice and friendly and they are always there to help if you need anything. I liked the fact that it is a university that you can study college courses at and, because it is a university, they treat you more like an adult. I really like being a student here because it is a very friendly place to study at. It only took me about a month to settle in, so not long. If I had to describe my time at NTU in three words, I’d say fun, friendly and interesting!